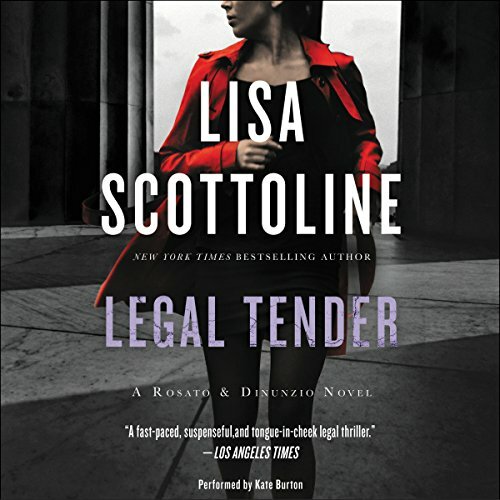 In the second thrilling novel in New York Times best-selling author Lisa Scottoline's Rosato & Associates series, a successful lawyer now finds herself on the opposite side of the bench when she's framed for murder. Benedetta "Bennie" Rosato is a maverick lawyer who prosecutes police misconduct and excessive-force cases, and business at her firm has never been better. To prove her innocence, Bennie probes deep into the murder. Then another killing takes place. Running for her life, Bennie is a fugitive armed only with her wits and courage. She will find the real killer - or die trying. This is a roller coaster thriller that will stop your breath at times. Well worth the time to listen to it. I plan to listen to all of Ms. Scottoline's audiobooks in this series. EXCELLENT! Kept me going on a 7 hour drive from Ohio to MD! Interesting turns and twists... I must have missed some books as I was unaware of Mark's partnership with Bennie, but that just gives me more to look forward to. What made the experience of listening to Legal Tender the most enjoyable? I had read all the Rosato and DeNunzio books before I started on the Rosato and Associates series. Usually I would not do it that way...it just kind of happened. And in this case, it turned out to be a great idea because now I'm getting to see what led up to the later Bennie, and I'm really enjoying that. Very definitely...the author reveals just enough to keep you guessing all the way. Great mix of the mystery AND Bennie's personal life. Yes, Burton is one of my favorites and always does a great job adjusting her voice for different characters. LOVED the whole story line of Jamie17 and the resolution of that. BOY, am I thrilled there are a bunch more of this series to go. I know what I'll be using my next Platinum Membership for. This book was exciting and suspenseful! I like the Author I have read lots of her books! Thanks! This is one of my favorite books by this author, the twist intern at the very end and keep you on the edge of your seat listening. Very very good book! Narrator I do not care for at all, but not even she could ruin this story it was so awesome. Love this reader! Lisa's book does not disappoint. I really enjoy how Lisa weaves her stories! Fast-paced and exciting, I did not want to stop listening, even when I had to for one reason or another. I strongly recommend this audible book. I like this author a lot and the story was a good one, although I had a hard time with the narrator. The narrator's tone was very intense and she kept the same tone throughout most of the book, it made it quite difficult to enjoy.